We present a dense grid of evolutionary tracks and isochrones of rotating massive main-sequence stars. We provide three grids with different initial compositions tailored to compare with early OB stars in the Small and Large Magellanic Clouds and in the Galaxy. Each grid covers masses ranging from 5 to 60 Msun and initial rotation rates between 0 and about 600 km/s. To calibrate our models we used the results of the VLT-FLAMES Survey of Massive Stars. We determine the amount of convective overshooting by using the observed drop in rotation rates for stars with surface gravities log g < 3.2 to determine the width of the main sequence. We calibrate the efficiency of rotationally induced mixing using the nitrogen abundance determinations for B stars in the Large Magellanic cloud. We describe and provide evolutionary tracks and the evolution of the central and surface abundances. In particular, we discuss the occurrence of quasi-chemically homogeneous evolution, i.e. the severe effects of efficient mixing of the stellar interior found for the most massive fast rotators. 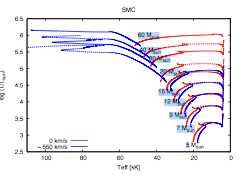 We provide a detailed set of isochrones for rotating stars. Rotation as an initial parameter leads to a degeneracy between the age and the mass of massive main sequence stars if determined from its observed location in the Hertzsprung-Russell diagram. We show that the consideration of surface abundances can resolve this degeneracy.